In the middle of early voting for the special election for Georgia Statehouse District 175, we will phonebank at the party office. Turnout is usually low in special elections, so if we can get Democrats to go vote, we win. 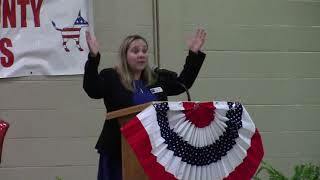 So far there’s one Democrat running for GA 175: Dr. Treva Gear. All three of these candidates have spoken at LCDP meetings. There are other Democrats running for other offices. This entry was posted in Candidates, Congress, Elections, GA Legislature, Special Election and tagged 2017-12-04, Candidates, Chair, Elections, Fred Swann, Georgia, Gretchen Quarterman, J.D. Rice, Jim Parker, LCDP, Lisa Ring, Lowndes County, Lowndes County Democratic Party, phonebank, plan, platform, Treva Gear, Valdosta on January 11, 2018 by lowndesdems.